If you are a reader of my blog, you know of my intention to move to the Atlanta area to be near my family next year. When I do move, my expectations will be that I will be living in a very small apartment, one that will have an approximately 5' x 7' kitchen. There will have to be a lot of downsizing when I pull my possessions out of storage next year. I don't consider this a bad thing at all, but just a part of my journey to a simpler and more serene life. However, as I do plan to continue cooking I will have to have the basics for my kitchen and I will need solutions for storage and display. I love the idea of having a pegboard. As long as there is wall space this seems like a good idea for me. 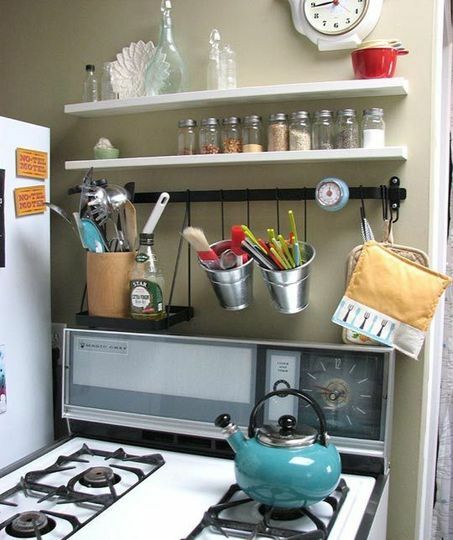 My youngest daughter, who has a very small kitchen space has something similar to this idea in her kitchen. She got hers from Ikea, so I am sure it will be a favorite place for me when I get to Atlanta. I like the idea of having the cooking utensils close at hand, but not taking up valuable counter space. 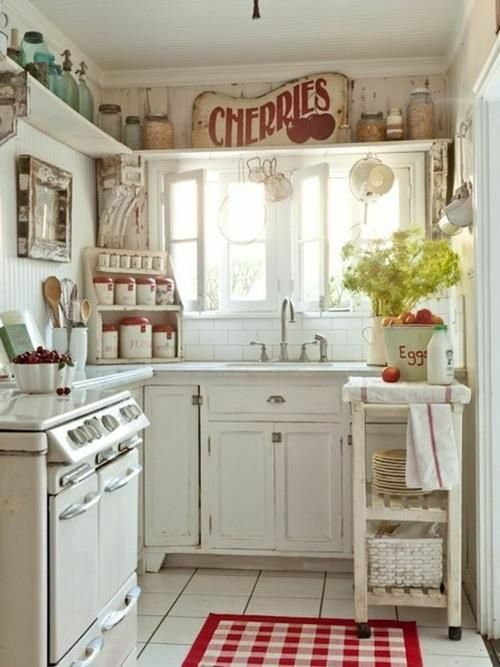 This kitchen is adorable. I love all of the glass jars. (I've been collecting some in anticipation) They are pretty to look at, great for storage, and allow you to easily see what they contain. I have a vintage rolling metal cart, which I hope I will be able to squeeze in. 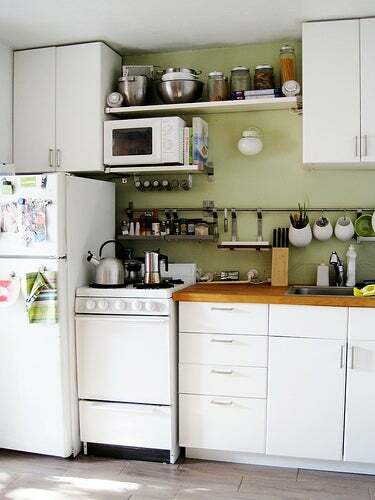 This looks like a very efficient tiny apartment kitchen space. Once again they have the hanging unit on the wall and I like that they have hung the microwave over the small apartment size stove. Of course it is almost impossible to talk small kitchens without looking at Brenda's cozy creation. She has so many wonderful ideas. There are so many people downsizing into smaller places these days, for many different reasons. Cozy, simple, and serene. It works for me. P.S. For more kitchen ideas, big and small, check out my Pinterest board Kozy Kitchens. It really is fun to downsize in a way! Finding what really makes you happy and what you need as opposed to too much stuff. 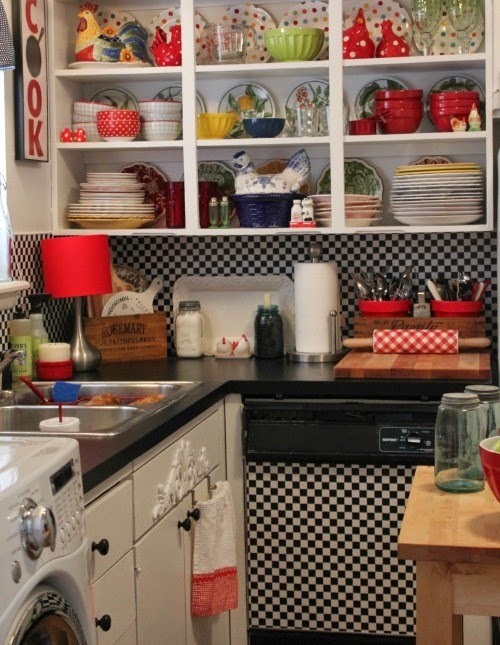 Storage in small spaces is always a problem, but your ideas for the kitchen are good one's. Brenda is also my go to gal for great and creative solutions to small spaces. The best thing I did for creating space in a small kitchen was to get rid of the microwave, toaster oven and numerous other gadgets. I realized that I cooked three meals a day, in a much smaller kitchen, when my children were growing up without all these so called time saving gadgets. When I was a teenager we lived in less than a thousand feet, three bedrooms, one bath and there were seven of us. The kitchen was U shaped and only had 2 foot of counter space on each side of the sink. My mother cooked holiday meals and family meals for over thirty years in that kitchen and without gadgets. That is simplifying and downsizing to me. Yesterday I was pinning from your Kozy Kitchens! Thanks for the shout out! You have great inspiration here, Laura. It really depends on what you need and use on a daily basis. I corral my utensils in two crocks right near the stove. No wall space in my pretty large kitchen. My biggest problem is storing pots and pans neatly and the never ending dilemma with plastic containers. Help people!! Laura, you don't say where you live now..but I lived in Florida years ago for a short time and it was lovely. The memories that come to me of it are so special. My husband was a career serviceman and we had a great time there. I do have a daughter in Georgia..(I did. I'm so used to saying that) her family is still there..so far from home. Anyway...the kitchens are adorable. You must be planning to live in a very small place. I had the same plan but it changed. Being near family is a wonderful thing. My other six children are nearby..thankfully. Thank you for becoming a follower. I appreciate that so much! I actually live in Kentucky now. It is my home state. I am planning to move to a very small apartment. There is just one of me and I am ready for a simpler life. Thanks so much for the return visit. It is so nice to meet you. I especially like the peg board for storage. In a small kitchen i like to have all that I need and a small amount of decor. I chose a red tea kettle, red silk flowers in blue ball jar, and anything else sitting out is used often like kitchen aid mixer which is of the old white variety. Storing a good amount of things and selling them over time is some work but will bring in a bit of money here and there. Having a tag sale will help many items go at one time. They all look pretty cozy. Gotta have a cozy, warm kitchen nook. It does feel good to get rid of things. I guess we get to a point in our lives where we just don't want it all anymore. I think small kitchens can work really well with the proper organization. Love all the examples you've shown, especially that third one, so cozy and charming. The third one is my favorite too, Diane. I could move right on in to that kitchen. Love the first one, all such great ideas. Hi Laura, those ideas look just perfect. I'm sure you will get the small kitchen of your dreams. 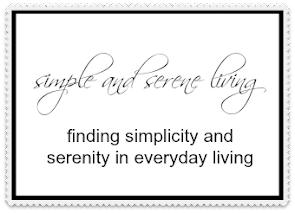 Simplify one life is good because it helps you focus on more important things. One thing that works for me when I had to move was time. I had already got rid of lots of things but I still have some that need to be sort out. Luckily, one of my relative have a place were I could stock some of my belongings, those I couldn't take with me. After a year I have come to realise that I didn't miss or need the most of the things I had stored up. I just got rid of 4/5 of it one month ago. Now I only live with things I really need and use on a daily basis now. My kitchen is about 9x9 feet and it's the hugest one I've ever had! But I love all my previous tiny kitchens and I cooked all my meals in them! My downsized kitchen is 8X12 and 12 foot tall. My dream old green gas stove from the twenties is right beside the smallest dishwasher (18") in the world. I love my kitchen and you will find your small kitchen the hub of your new apartment too. Great blog today. Your research really got down to the heart of small kitchens.